Since the 1950’s, there have been several attempts to develop non-contact substitutes for conventional Quantum Efficiency (QE) measurements. Researchers identified Photoconductance and Photoluminescence Excitation (PLE) spectroscopy as reasonable candidates, and these have been successfully demonstrated on GaAs (and other direct gap) solar cells. Other approaches have utilized microwave probes and capacitive sensing of the surface barrier (SPV), but all of these techniques experience drawbacks when the sample contains a pn junction with limited base diffusion length. The difficulty stems in part from what some papers have described as ‘insensitivity to … mobility degradation’, and others have modeled as diffusion-limited or voltage-independent carriers[4,5]. These are photogenerated carriers that are generated by the incident light, but which are not actually collected by the short-circuit QE measurement that we wish to emulate. This undesirable over-response by non-contact techniques, which is particularly troublesome at longer wavelengths in silicon cells due to the weak absorption coefficient and thick base, has presented a barrier to the development of a non-contact proxy for the QE measurement in indirect materials. In this whitepaper, we present a high-speed, non-contact method that naturally suppresses the effect of voltage independent carriers in silicon PV devices, both with and without metallization. The technique physically separates the excitation and emission regions in a novel fashion to completely eliminate the effect of diffusion-limited carriers. Tau Science, working under DOE SBIR grant DE-SC0008281, has developed a non-contact technique that acts as a proxy for conventional, short circuited Quantum Efficiency measurements. The technique is commercially available in two configurations: a manually loaded laboratory systems for R&D, and a fully automated high speed inline metrology system. Because the technique operates in non-contact mode, it may be integrated into cell sorters without the need for probes or vacuum chucks, thus reducing cost and complexity. An AC-modulated LED light engine (configurable from 16 to 64 wavelengths) spans the 300-1300nm wavelength range, and the beams are combined via fiber optics and directed to the cell to stimulate luminescence in what we shall call the ‘illuminated region’. This region absorbs the incoming light and, as might be expected, luminesces synchronously with the intensity of each modulated LED. 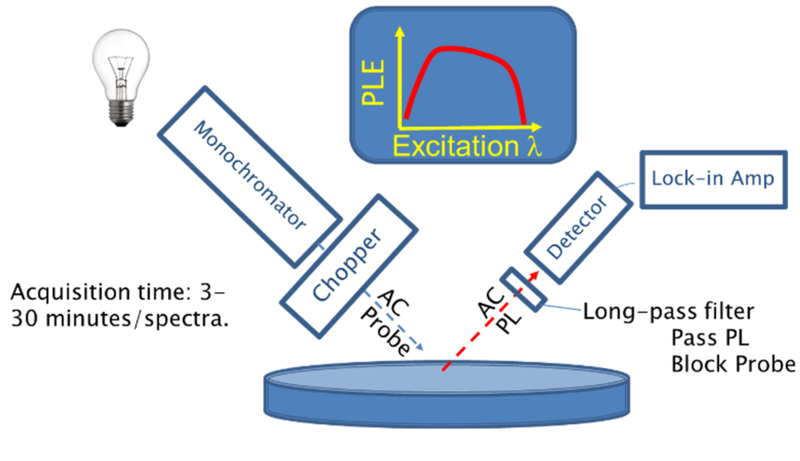 Traditionally, if the PL emission yield (number of luminescent photons emitted per incident photon) is plotted vs. wavelength, this is called Photoluminescence Excitation Spectroscopy, or PLE. Figure 1. Schematic of traditional non-contact PLE apparatus. Beginning in the 1960’s PLE has been used on direct-gap bulk semiconductors and pn junctions as a non-contact proxy for QE measurements, and strong correlations between PLE and QE have been reported. Recent work has revived and modernized the technique using LED illuminators and pointed out the strengths of the technique for inline process control. Figure 2. A comparison of PLE vs QE for typical direct gap (left) and indirect gap (right) materials. For indirect materials, the long-wavelength discrepancy is significant. However, success on direct-gap semiconductors does not guarantee success on all semiconductors. The soft, indirect absorption edge of silicon, the most common material in the PV industry, presents a challenge: some photogenerated carriers are simply unable to travel back to the junction, and are labelled, by various authors, ‘voltage independent’ or ‘diffusion limited’. The 2002 paper by Cuevas and Sinton clearly describes the effect. When we observe silicon QE curves, the long-wavelength effect is apparent: a slow roll-off of the QE as we approach the bandgap of silicon. This long-wavelength response is of particular importance to modern silicon cells, which are highly engineered to reduce back surface recombination and enhance IR reflectance. 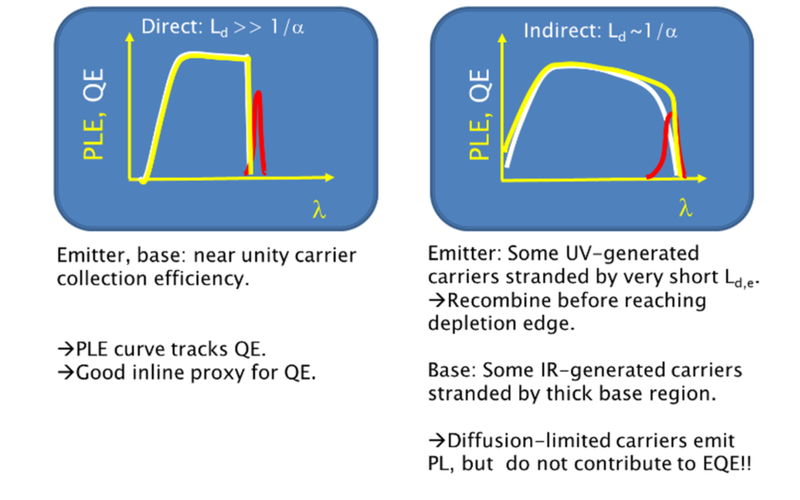 Non-contact techniques that might be used as an inline QE proxy, therefore, must somehow be insensitive to the population of voltage independent carriers. To date, however, the traditional non-contact techniques have suffered from one drawback: photoconductivity, microwave reflectance, and PLE all sense and report the presence of the voltage independent carriers, and thus the long-wavelength response is artificially elevated for indirect gap materials. These techniques are unable to distinguish excess carriers that are collected by the junction from those that are not. For the non-contact technique to be useful in a manufacturing line, the shape of the curve must be predictive of the eventual QE response, and so a new technique must be developed. Figure 3. From H. Mackel and A. Cuevas, Solar Energy Materials and Solar Cells 71 (2002) 295-312. Demonstrates the expected long-wavelength discrepancy between contacting, short-circuit spectral response technique and a non-contact photoconductance technique. The technique introduced here by Tau Science depends upon two particular prior works: the first is Sinton’s introduction, in 2008, to the concept of ‘non-contact Electroluminescence’. This work pointed out that if one region of a solar cell is illuminated it will photoluminesce, while the surrounding (un-illuminated) regions will electroluminesce. Paradoxically, cell contacts and an external power supply are not required to generate this electroluminescence signal: the effect can be stimulated and observed with photons in and photons out. The illuminated region, in this case, acts as an onboard power supply: the local splitting of the quasi-Fermi levels (strong forward bias) in the illuminated region drives a lateral current through the metallization, and the surrounding area is driven into forward bias as if a conventional power supply were connected to the cell. The second important piece of prior art was described in Johnston’s publication and 2017 patent of a non-contact scanning electroluminescence technique. This uses the non-contact EL effect, described above, to rapidly scan across a cell or module and form an electroluminescence image. The key concept is that the illuminated region is physically separated from the emission region so that lateral current transport through the heavily doped (and metalized) regions is required to stimulate the detected luminescence. Thus, problems with the metallization or contact resistance are detected in non-contact EL, just as they would be in a conventional EL image. The illuminated region once again acts as an onboard power supply: the EL image is generated using only photons in and photons out. 1. One region is illuminated by the LED light engine, and this region does contain stranded carriers that would be detected by a non-contact probe such as photoconductance or PLE. We do not wish to see the effect of these carriers in our ELE spectrum, and so we will not place our non-contact probe in this region. 2. The local quasi-Fermi level splitting in the illuminated region is controlled by the voltage-dependent carriers: the carriers that are actually collected by the junction [this is a truism, but key to the concept]. The stranded carriers play no role in this splitting, as the junction is unable to collect this carrier population. 3. The Fermi splitting applies an external bias, via the metallized cell conductors, to the surrounding cell [in fact, the effect can also be observed on unmetallized cells, as the doping levels are often sufficient to form quasi-conductors]. 4. The surrounding, non-illuminated region of the cell is pushed into forward bias, generating electroluminescence. Note that this EL signal is completely independent of the stranded carrier population: the voltage-independent carriers were, by definition, unable to modulate the Fermi splitting in the pump region, and so their effect cannot be conveyed to the surrounding regions. We therefore train the non-contact sensor (in this case ELE) on the non-illuminated region of the cell to eliminate the effect of voltage-independent carriers. In addition, it is useful to note that the shape of the ELE curve is completely determined by the properties of the illuminated region, and the emitting region only acts as an ‘indicator light’ that is controlled by the voltage-dependent carrier population in the illuminated region. In fact, the emitting region can be completely replaced, conceptually, by an LED connected in parallel with the cell under test: it need not have any material properties in common with the cell under test. Further, the gain of this indicator circuit can be controlled by a DC light bias (‘pump’) applied to the sample, as described and modeled by Davis et al, PVSC 2017. Figure 4. The effect of DC bias light on the strength of the ELE emission signal. Increasing the DC bias increases the gain of the EL emission ‘indicator light’. Note that the ELE technique is full-spectrum, unlike traditional PLE, and wavelengths can extend to (or below) the bandgap: incident light does not enter the detection region, and so there is no crosstalk between the illuminator and the luminescence signal. From references 9, 12. · This work was originally presented as “Non-contact Proxy for Conventional Quantum Efficiency Measurements,” G.S. Horner et al, 9th International Workshop on Crystalline Silicon for Solar Cells, 3rd Silicon Materials Workshop, Oct. 12th, 2016. · Further Discussion and modelling can be found in “Electroluminescence Excitation Spectroscopy: A Novel Approach to Non-Contact Quantum Efficiency Measurements,” Kristopher O. Davis et al, Proc. of the 2017 PVSC-44, Washington, DC, June 2017. 1. H.B. DeVore, “Spectral Distribution of Photoconductivity,” Phys. Rev. 102(1), pp. 86-91 (1955). 2. G.D. Pettit, “Photoluminescent characterization of GaAs solar cells,” Appl. Phys. Lett. Vol. 35, no. 4, pp. 335-337 (1979). 3. D. Berdebes et al, “Photoluminescence Excitation Spectroscopy for In-Line Optical Characterization of Crystalline Solar Cells,” IEEE Journal of Photovoltaics 3(4), pp. 2156-3381 (2013). 4. M.D. Abbott et al, “The effect of diffusion-limited lifetime on implied current voltage curves based on photoluminescence data,” Journal of Applied Physics 102 (4) p044502 (2007). 5. M.K. Juhl et al, “The impact of voltage independent carriers on implied voltage measurements on silicon devices,” Proc. 26th Workshop on Crystalline Silicon Solar Cells and Modules pp. 102- 105 (2016). 6. J.S. Bhosale et al, “Steady-state photoluminescent excitation characterization of semiconductor carrier recombination,” Rev. Sci. Inst. 87, 013104 (2016). 7. A. Cuevas and R. Sinton, “A contactless photoconductance technique to evaluate the quantum efficiency of solar cell emitters,” Solar Energy Mat. & Solar Cells 71 pp. 295-312 (2002). 8. R.A. Sinton, “Contactless Electroluminescence for Shunt-Value Measurement in Solar Cells,” 23rd European Photovoltaic Solar Energy Conference, Sep. 1-5, Valencia, Spain, pp.1157-1159 (2008). 9. Davis et al, “Electroluminescence Excitation Spectroscopy: A Novel Approach to Non-Contact Quantum Efficiency Measurements,” in publication, Proc. 44th PVSC, Washington DC, June 2017. 10. S. Johnston, “Contactless electroluminescence imaging for cell and module characterization,” Proc. PVSC 2015, 10.1109/PVSC.2015.7356423. 11. S. Johnston, “Luminescence imaging systems and methods for evaluating photovoltaic devices,” Patent US9641125 B2, issued May 2, 2017. 12. G.S. Horner et al, “Non-contact Proxy for Conventional Quantum Efficiency Measurements,” 9th International Workshop on Crystalline Silicon for Solar Cells, 3rd Silicon Materials Workshop, Oct. 12th, 2016. This work was supported under DOE Grant No. DE-SC0008281.